Just over a month ago, I made my very first blog post – To Blog or not to blog? That is the question – and outlined my blogging intentions to read more books, write about what I read and to connect with fellow booklovers and bloggers. And I have. In fact, I’ve been bitten by the blogging bug. 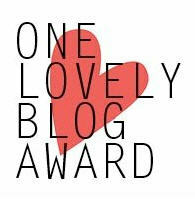 I’m so excited to be awarded The Versatile Blogger Award from Sapna and Sharmistha at Easyondeyes. These two book-loving women are posting a book review every day of this year on their blog. That’s right, 366 book reviews! With 7 months to go, you should definitely go and check out their blog and offer your support. It is my great pleasure to pay it forward and list the blogs that have made me contract blog envy. As I am new to blogging, I have stopped at 10. Kellie Elmore is an American author who has just released a book called Magic in the Backyard. You should read the extract on Amazon. Kellie writes beautiful prose inspired by her South-east Tennessee surroundings. You can also follow Kellie on her author/writing journey at her blog. I connected with Mary from Tothebalcony over her post ‘Why read books if you can watch movies?’ Mary is a book lover from Kenya who is currently living in Italy. I love her book choices! Bundleofbooks is a bookworm who reads A LOT! If you need a good book recommendation, check out her blog! I connected with Louise at her blog Louise Radcliffe over a mutual love of Charlaine Harris books. Louise blogs from the UK about books, baseball and the bible! Joy at Irreverently Untitled writes about books, movies, animals and lots of other interesting things. She also takes amazing photos! Austenprose is the perfect place for a Jane Austen tragic like me. Join the discussion of Jane Austen’s novels, movies, sequels and the pop culture she has inspired. I discovered Sorryiamnotsorry through Freshly Pressed. It’s a light-hearted look at love, life and the sometimes scary world of dating. It’s laugh-out-loud funny! Earl’s World is a photography blog I also discovered through Freshly Pressed. Earl’s photos make ordinary objects look extraordinary. Literary Minded (Angela) is a professional blogger here in Australia and at the top of the book blogging game. This site is full of book reviews, interviews with authors and all the insider information about what’s going on in the publishing world. When I picture my dream home, I only picture one room – the library. My dream library has two storeys of shelves, a wrought iron spiral staircase and one of those cool ladders on wheels. And books, lots and lots of books! I love dogs. I don’t own one so just inflict my affection on any poor canine that crosses my path. Being in or near water makes me happy and at peace. I grew up swimming in the sea. I think I must have been a dolphin in a past life. Music plays an important part in my life. I listen to music on the way to work, at work, on the way home from work … I also play piano and guitar very badly. I spent a couple of years in South Korea teaching English to children and adults. This week marks the 10th anniversary of my first stint there. It’s hard to believe that the youngest kids I taught would now be fourteen and the oldest kids would be adults in their mid-twenties. Where did time go? And why do I still feel like I’m twenty-one? Jane Austen is my literary hero. When I lived in the UK I kind of turned into a Jane Austen stalker. I visited one of the houses where she lived, Winchester Cathedral where she is buried, the house where she died, the Jane Austen Centre in Bath – even the village of Lacock where they filmed some of the outdoor sequences in the BBC TV series Pride and Prejudice. I never get tired of rereading her books.